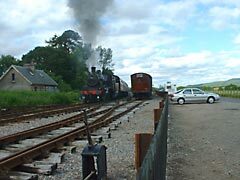 On this final page of our holiday in Scotland you can find us riding on the preserved Strathspey Steam Railway from Broomhill to Aviemore, visiting Cawdor Castle near Nairn, and sampling a wee dram at the Dallas Dhu Distillery at Forres. 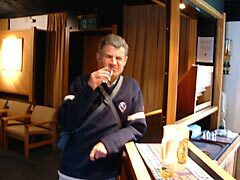 Then on the way home from Scotland we visited the Dun Cow at Sedgefield in County Durham. Och aye the noo! On day 5 of our Scotland holiday we took the steam train from Broomhill to Aviemore on the preserved Strathspey Steam Railway. 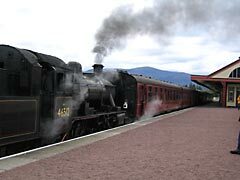 Here's the awesome steam locomotive sitting at Aviemore station after our initial ride - just look at all that lovely steam! 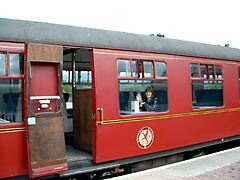 Opened in 1978 and extended in 2002, the nostalgic steam railway journey of around 20 miles took 35 minutes each way and cost £9 at the time of our visit. 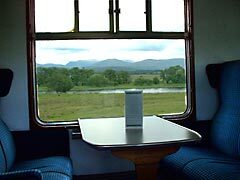 See our UK tourist resources for the Strathspey Steam Railway website. 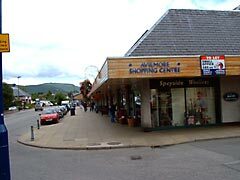 On arrival in Aviemore we had a good look around the town, had a coffee and bought some souvenirs. Aviemore is the centre of the winter skiing industry in Scotland so it's well geared up for tourists. 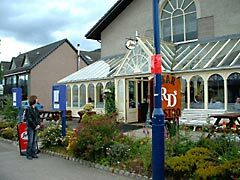 We came across this attractive bistro in Aviemore, were tempted in by the carvery - and succumbed! We ate our packed lunch we'd brought along back at the cottage in the conservatory that evening. The meal was yummy and we followed it with Apple Pie and cream, oh, and another wee pint for Mike and a cider for Belinda. Much better than a picnic in the cold outside. Och aye the noo! 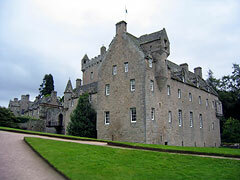 ...including the River Spey and Cairngorm Mountains. The line from Boat of Garten to Broomhill had only been re-opened a few years previously, necessitating a traditional style reconstruction of Broomhill station. Back at Broomhill, and just as we were about to drive back to the holiday cottage the steam engine came chuffing past so we quickly grabbed one last picture of the delightful Strathspey Steam Railway. 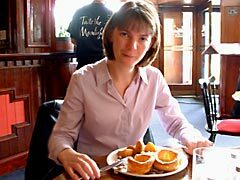 We enjoyed a hearty breakfast in the holiday cottage every morning in Scotland to set us up for a hard day's touring! Och aye the ... you get the idea. 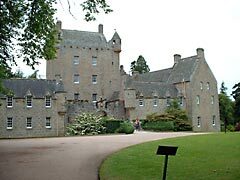 In the morning of the last day of our holiday in Scotland we visited Cawdor Castle near Nairn, which is still lived in by the Cawdor family. 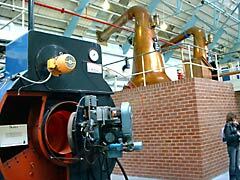 ...headed over to the Dallas Dhu Distillery in Forres. 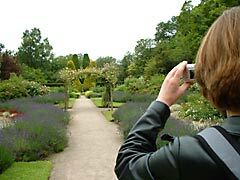 Now before you ask, this old fashioned looking mobile phone is, in fact, the audio tour handset which we carried round with us during our visit. 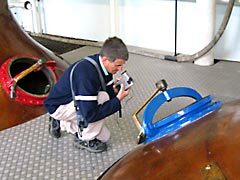 Dallas Dhu isn't a working distillery any more, but the self-guided audio tour took us round all the distillery machinery that used to be used for whisky production, learning what it all did along the way. Mike will film anything, even the insides of a still, och aye the noo. See also our highland videos. Right, next up was an opportunity to try the Scotch! 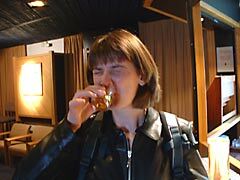 Whisky sampling... well, the face says it all really! 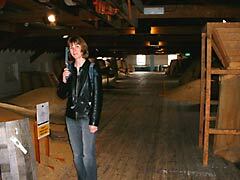 We tried a wee dram before viewing the distillery's video in the theatre at Dallas Dhu Distillery. ...journey for us so we broke it each way with an overnight in a Travel Lodge near Sedgefield in County Durham (near Teesside). 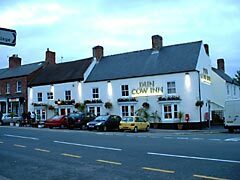 Here we found a fantastic pub, The Dun Cow Inn and enjoyed an excellent meal on the homeward bound leg. Och aye... and all that! 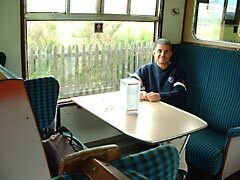 Other preserved railways we've ridden: West Somerset, GWR Cotswolds, and mid Wales.